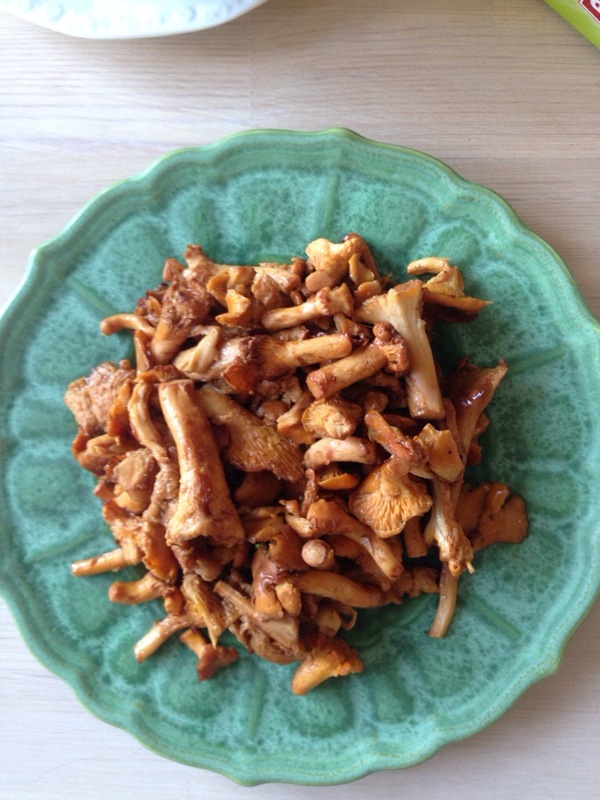 One of the most anticipated culinary events of our yearly Swedish Summer holiday, apart from crayfish eating, is going to the local market to buy Swedish ‘kantareller’ (chanterelle in English). The yellow, meaty and funnel-shaped mushroom is a delicacy that can be picked between July and October in most forests in Sweden and it is quite prolific. Mushroom picking is something that many do over here and there is nothing more satisfying than returning back home with a basket full of yellow chanterelle or ‘forest gold’ as it is also called. This years’ Summer heat wave has limited the supply somewhat but you can still find many outdoor markets selling the stunning fungi. It is and always have been, an incredibly popular ingredient that has s natural place at any Swedish Summer table due to its wide variety of culinary uses. With locally grown veggies and a selection of yummy dips, you can create something quite simple yet incredibly delicious with this beautiful mushroom. 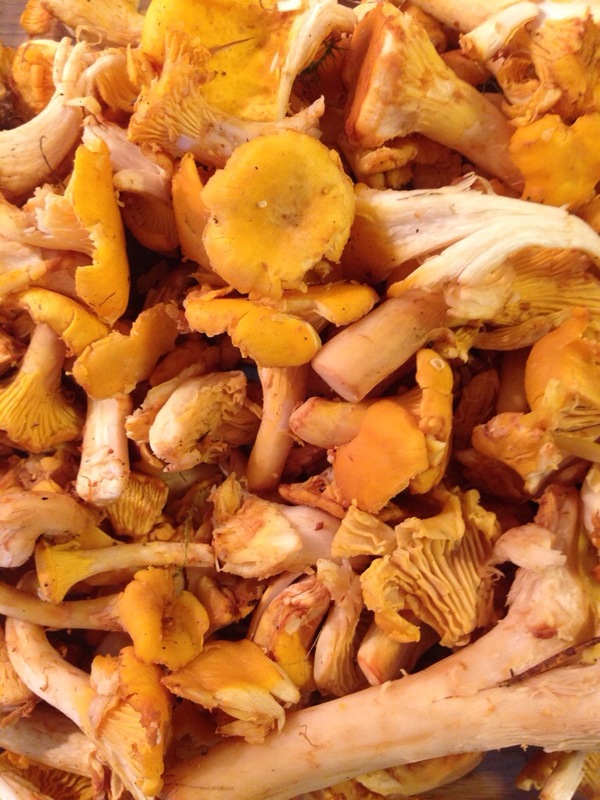 Start by brushing off dirt from the chanterelles with a pastry brush or any other soft brush – not silicon though. The saying is that you don’t rinse them in water although I have friends who says it mays no difference at all to put them in a cold water bath and gently dry them off on a sheet of kitchen roll. Perhaps you can try both methods but I stick to brushing. Once cleaned put in a large frying pan with a dollop of butter (they soak up a lot so be generous) or oil and let saute on low heat. Once cooked place on serving dish. Wash the new potatoes and boil until done, I like a slight bite with mine so I don’t let them cook for too long. Let cool slightly and decorate with generous sprigs of dill (my favorite herb). Chop up 2 charlotte onions into tiny pieces and mix into the yoghurt together with the salt and pepper, add dill in desired quantities. 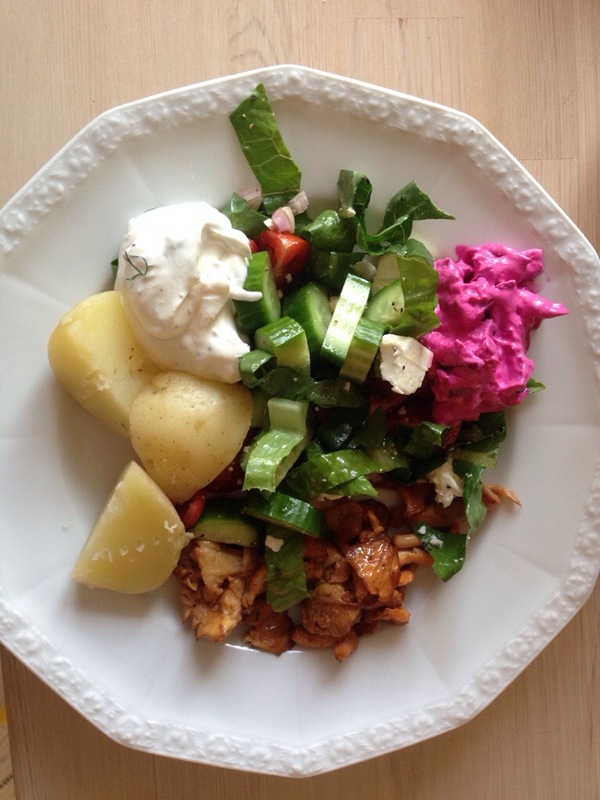 Chop the boiled beetroot and mix with the vegi/mayonnaise, add a bit of sea salt if required and place in a small dish. Chop up the tomatoes, cucumber and one charlotte onion, add salt, pepper, oil and vinegar and mix thoroughly. 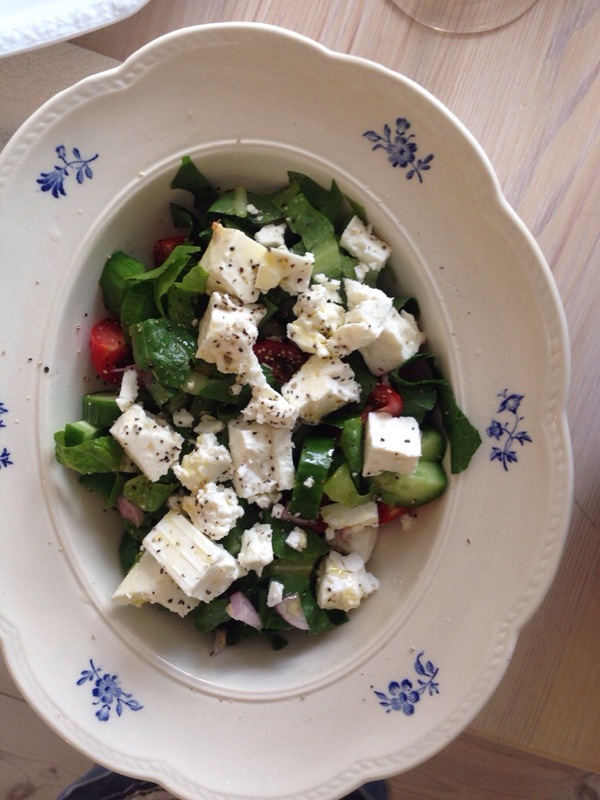 Sprinkle the feta liberally over.